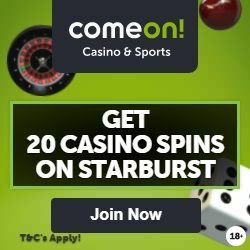 The first thing you will notice when you log on to the ComeOn online casino is how very professional it is and how much time and effort has obviously been put into getting this online casino to cover every single aspect that could be needed by the players, both at the sign up point as well as during their game playing. The homepage is a burst of colourful and exciting attention grabbers, covering a range of different casino aspects. Come On offers a variety of different genres of online casino games, here you can find Sports Betting, Casino and Poker rooms. This really could be a one stop shop for online gamers. I recently signed up myself to do a little investigation on your behalf, here you will find a summary of all I came across when I logged on and signed up. The information below is based on my own experience with this online casino and may not be the same for every visitor, nothing is gospel! So let’s start from the sign up page and work our way through the Come On online casino experience. What does Come On offer me as a player? As I mentioned previously this online casino offers : casino games, live sports betting and poker. The software providers used are : Net Entertainment, CTXM, Microgaming and Sheriff gaming. You can read more about each and every software provider on the Software Provider pages. Come On seem to have a brilliant sense of humour, which is one of the first things that struck me when reading why I should choose this online casino. Their text is simple, easy to understand and witty – it will defintely bring a smile to your face so I recommend reading it! Based in the little gem of an island, Malta these guys are totally legit with all the licenses and what not needed to run an online casino to the highest of standards. The sign-up page is easy to use and basic so there is no confusion, you just add you details to the boxes as required and register by clicking the send button at the bottom of the page. If you occur any difficulties at this stage then on the right hand side of the screen you will find three ways to contact the Come On customer support team. The first option is Live chat, this will open up a pop up window where you can have a one to one conversation directly with a customer support agent. This is the fastest way to solve any issues. The second option is to e-mail the customer service department and await there reply. The third and final solution is to call them on the number they have provided, there’s no need to worry about hefty phone bills though as all you need to do is to leave your details and they will call you back themselves. I contacted the Come on customer support live chat after signing up, as I didn’t receive my 10 free spins on the Net Entertainment Jack Hammer videoslot. The response was speedy, friendly and courteous so I went on to tell the agent my issues. The information given was fast and relevant, this offer was not valid for my region. All very well but I had to admit that it was slightly misinforming when they are clearly advertising this bonus all over their casino that this was the offer upon sign up, it didn’t mention that I might be living in the wrong part of the world to be eligible for this offer! Oh well, my bad luck I suppose but the support served its purpose and set em on the right track. So 10 out of 10 for the support agent! The bonuses on offer at the time of writing this review where a 100% of up to 25 euros in the casino section and the live sports betting section too. The Poker section offers a 110% bonus on all deposits up to $600. In some regions there is a bonus of 10 free spins on the Jack Hammer slot. Bonuses given must be wagered 30 times, this means if you were to deposit 20 euros and receive another 20 euros bonus money that would give you a total of 40 euros to play with. The whole 40 euros must be wagered ( played with ) 30 times, which means you need to make use of 1200 euros before you can withdraw any money from the casino. Some countries are excluded from the bonus offers so I would advise you to check your eligibility prior to signing up. 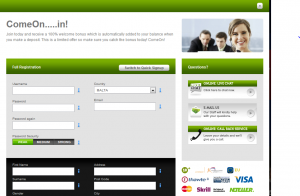 Come On offers many many payment offers which vary for different countries. 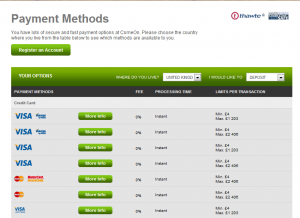 You can check which payment methods are available for your region and choose the easiest and most effective way for you. I had another query regarding this so I again contacted the customer care agent in an online chat, this time however the agent couldn’t give me an answer to my query right there and then. My issue was that I had a foreign bank account based in another country where iDeal is the best payment method to use, however I was residing in Malta where iDeal is not a payment method offered. I was informed by the agent that I would have to use another form of payment, ”but I want to use iDeal can you please help” was my reply. Sure enough the agent sent on my request to the payment department and informed me I would get a reply by e-mail. Update!! 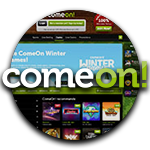 After writing this review, I received another e-mail from Come On online casino. To my surprise, they had reviewed my chat and apologized for misinforming me about the iDeal availability in Malta. They then went on to enable the iDeal method in order for me to be able to deposit my money my way! I was over the moon with the mail, they really went over and above to please their clients, something you don’t always see a lot of these days. I must say 10/10 for customer service again, hurrah for Come On!! Making a withdrawal with Come On online casino couldn’t be simpler, these guys have really thought of everything!! 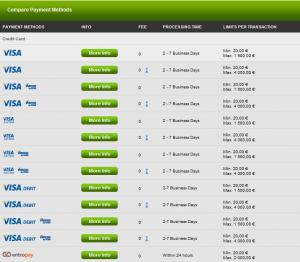 You simply go to My Account and click deposit or withdraw. 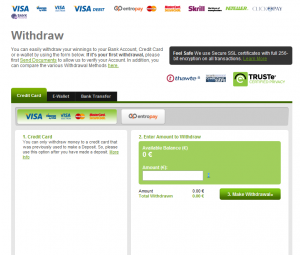 Once you have chosen withdraw you are taken to the Withdrawals page. Here you have to choose how you would like to receive your withdrawal – credit card, e-wallet or bank transfer. Then choose the payment method you use and the amount you would like to withdraw. Before this though Come On will need your identification papers to prove you are really the big winner you claim to be, so a little above the withdrawals page you will see a link that says ‘send documents’, click it and it will take you through a step by step guide to upload all the documentation needed. It’s as easy as that! To check which withdrawal methods will get to you quickest you can check out their compare withdrawals page, to make sure you are getting the quickest and smoothest service around. Good Luck with your game playing at Come On casino, it definetly gets my vote! 8 out of 10 from us here at onlinecasino1.com!